Location: The Elam Ranch is located approximately 70 miles northeast of Ft. Worth, Texas, and a convenient 68 miles from Dallas, Texas. It is approximately 2.5 miles west of Rosston, Texas, with county road frontage on County Road 362 (Rosston Road). The property lies on the county line with approximately 63 acres in Cooke County and approximately 102 acres in Montague County. Directions: From Ft. Worth, Texas, travel Interstate 35W north to the 35 E proceeding north to the Valley View/FM 922 exit. Turn left (west) onto FM 922 and travel approximately 17 miles to the town of Rosston. Turn left on CR 362 (Palmer Street) and travel approximately 2.6 miles to the ranch entry gate on your right hand side. From Dallas, Texas, travel Interstate 35E to the north and merge onto 35W in Denton, Texas. Proceed on Interstate 35W north to FM 922 in Valley View, Texas. Turn left (west) onto FM 922 and travel Turn left (west) onto FM 922 and travel approximately 17 miles to the town of Rosston. Turn left on CR 362 (Palmer Street) and travel approximately 2.6 miles to the ranch entry gate on your right hand side. 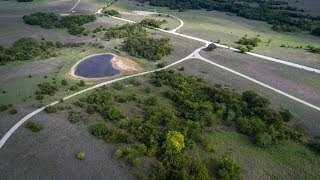 Overview: The Flint Hills of Kansas seemingly meet North Texas at the Elam Ranch! Enjoy recreation, relaxation, livestock production and/or a primary or secondary residence amongst rolling fertile native pastures laden with traces of limestone, hardwood tree cover and an incredible seasonal creek with 30+/- feet banks for notable distances. Multiple ponds and creek tributaries foster a productive livestock production and recreational tract of land. The pasture is turnkey with working pens, cattle guards, electricity, water well, and multiple water resources. Hunting and fishing opportunities abound! Combination ranch features are complimented with excellent access, large neighbors, and close proximity to the Dallas/Fort Worth Metroplex area - a quick one -hour drive! A variety of dining, entertainment, and live music is prevalent in nearby Denton, Decatur, Gainesville, Muenster, St. Jo and Nocona Texas - all within a 20 minute drive of the ranch! Enjoy quaint country venues such as Red River Station BBQ and Davis and Blevins Main Street Gallery. The award winning Era School District serves the local area with a total enrollment of approximately 500. Improvements: Most barbed wire boundary and cross fences are in fair to moderate condition. A set of pipe rail working pens contiguous to a metal livestock shed (approximately 30&apos;X 40&apos;) is located in the south central area of the ranch. Perimeter and interior gated entrances are pipe rail and complimented by cattle guards. Two electric powered water wells are located on the ranch, but not currently working. Residential electricity is readily available on the ranch. Trees, Grasses and Forbs: The pasture is home to excellent native grass species including Big and Little Bluestem, Indian Grass, and Sideoats Grama. Natural forbs indigenous to the pasture include Sharptooth Gayfeather, Cranesbill, and Goldenrod. Native tree species mixed across the pasture include multiple sub-species of Red Oak, Shumard Oak, Live Oak. Natural protein sources are prevalent with abundant acorns and other nutritional sources such as Persimmon. Cedar, Elm, Bois d &apos;arc, and Cotton Woods grow along the creek downslopes and edges of the grasslands. Topography: The terrain encompasses rolling to flat pastures with scenic draws, pinch points and drainage embankments traversing the property. Elevation change is 90+/- feet. There are two scenic ridges forming primary drainage tributaries for the primary creek drainage. The diverse topography provides vistas, pinch points, and travel corridors for wildlife. The riparian area along the creek is moderately dense with mature hardwood tree varieties. Density of cover is open to moderately wooded, creating great wildlife habitat. This is a quality combination ranch! Wildlife and Fisheries:Whitetail deer are abundant as well as an occasional Rio Grande Turkey. Dove, waterfowl, feral hogs and an occasional covey of Bobwhite quail make for excellent wildlife diversity on the Elam Ranch. There are no hunting leases that effect the property. The southwest pond is stocked with populations of baitfish, Largemouth Bass, and Crappie. Livestock Production: Should a future owner desire a small cattle herd, previous carrying capacity for the native pasture under current management is approximately 12 - 15 AU&apos;s. Utilization of cell grazing and/or additions to pasture improvement may increase carrying capacity for the pastures. Water: Water resources are above average for the location. Two water wells are located on the property. In addition, an excellent stock tank is located in the southwest quadrant. The pond is fed by water shed from a nearby ridge bank as well as a spring as represented by the Seller. A secondary pond is located in the southeast quadrant of the ranch and can be fed by a nearby water well. The creek is a major drainage tributary that runs from the northeast to the southwest through the property providing secondary drainage channels together with nice runs and pockets of live water especially in the spring and fall months. Minerals:None of the Seller owned minerals convey at this price. Any minerals conveyed by the Seller would be under separate negotiation. There is one producing well located on the ranch. The property is located in the Barnett Shale. Easements: There are two pipeline easements located on the south end of the property near Rosston Road. Property Taxes: The property currently carries an Agricultural Exemption. Property taxes for 2017 were $2,830.00. Summary: Located a convenient one hour drive from the D/FW Metroplex, this is a high quality combination ranch tract. It is well configured, accessible and offers excellent opportunity for hunting, fishing, a rural home site(s), livestock production and enjoying the great outdoors!